From our friend at LegalArt comes another one of their great seminars. If you are thinking about being a writer, or looking for new opportunities, definitely check this one out. 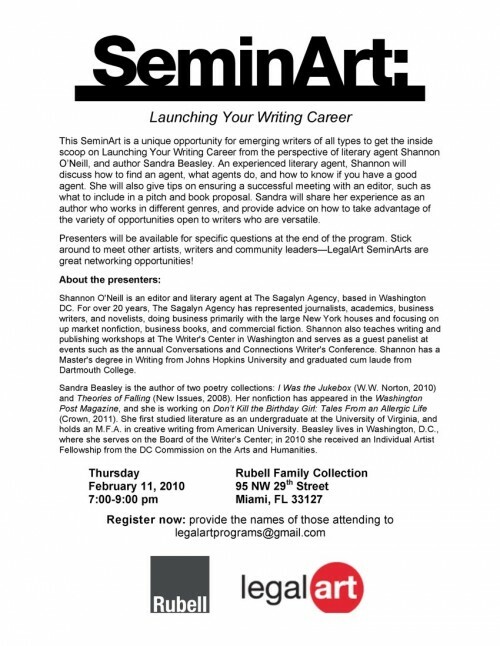 This SeminArt is a unique opportunity for emerging writers of all types to get the inside scoop on Launching Your Writing Career from the perspective of literary agent Shannon O’Neill, and author Sandra Beasley. An experienced literary agent, Shannon will discuss how to find an agent, what agents do, and how to know if you have a good agent. She will also give tips on ensuring a successful meeting with an editor, such as what to include in a pitch and book proposal. Sandra will share her experience as an author who works in different genres, and provide advice on how to take advantage of the variety of opportunities open to writers who are versatile. Presenters will be available for specific questions at the end of the program. Stick around to meet other artists, writers and community leaders. LegalArt SeminArts are great networking opportunities!